Another way Jack stays warm has to do with the generator in his truck that enables him to turn off the truck’s engine in the winter and not worry about the cab freezing or the engine not starting again. In fact, this generator is supposed to run at all times that the truck isn’t and keep the cab at room temperature or close to it. Unfortunately, reality is not quite that ideal. The generator sometimes breaks down and at those times Jack is forced to run the truck all night at any temperature below about 40 or 50 degrees (since even though Jack has an inner furnace, even he has a hard time sleeping when it’s below 50 degrees). When I first learned that trucking companies run big trucks all the time during the winter, or at least used to before they got generators to keep the cab warm even when the truck was not running, I was shocked at the amount of fuel that must be needed on a daily basis throughout the winter. This is unfortunate, and it’s impressive that Carlile is one of the first trucking companies in Alaska to start using the generators in order to cut down on fuel use. 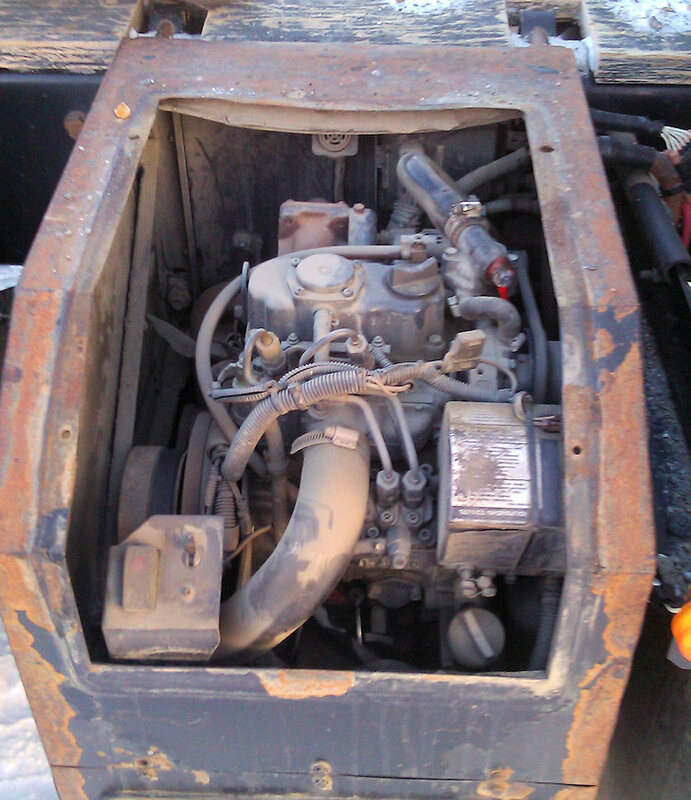 This 4KW generator runs on diesel which it draws from the truck’s fuel tank. 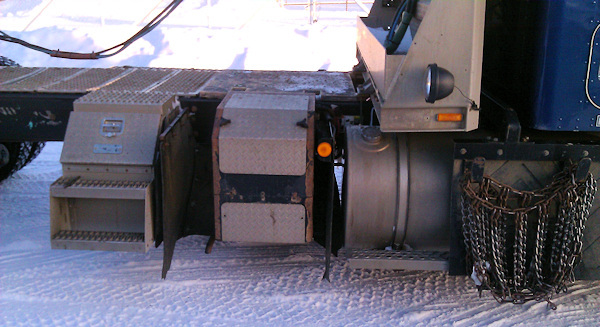 It powers an electric heater under the bed in the cab and a fan blows heated air into the cab from there. 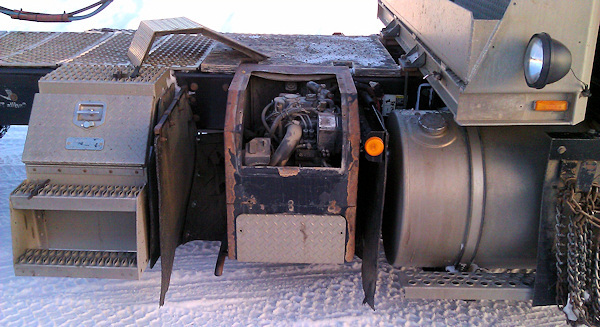 On top of that, the generator serves another purpose: to circulate antifreeze through the truck’s engine in cold temperatures, preventing it from getting too cold to start. It’s a great deal and all big rigs driven up here should have them to cut down on fuel usage. This entry was posted in Trucking and tagged alaska, carlile transportation, cold, cold temperatures, dalton highway, diesel, electric heater, freeze, fuel usage, generator, highway, ice road truckers, jack jessee, road, temperature, tractor, transportation, truck, trucker, trucking, trucking companies, vehicle, winter. That’s a great idea for Alaska especially. We have those down in the states too, but in those temperatures, heat is an absolute must. Thanks for sharing. I always wondered how they were able to stay warm in the truck. It’s also nice to see that Carlile coming up with a way to conserve fuel. Thats what that is. Always seen it, never knew what it was. More trucks should have them, as it will save loads of fuel, and during winter that will be a huge help. We got almost the same system on our trucks here in Norway. Its called webasto here, basically the same. Doesn’t charge the battery, it drains it instead. So you cant have it running for to long in the cold. But a night normally is no problem. Good system no matter what its called. Saves fuel and makes the conditions better for the driver as its less noise to keep the cab warm. Very nice! Thank you, Jack will enjoy hearing about this. Very informing, Back in the old days we let the trucks run 24 hours a day. At least that what we done when we was delivering rigs to Alaska when they was building the pipeline. Hi Jack + Judy! I have here in Volvo truck a hot water heater Webasto. It you can also preheat the motor only. A big problem is that all electricity needed from the battery. It can sometimes be the truck will not start because the battery is too low. We do not even have such low temperatures. But no problem, you can not just do as long break. I heard about Gabriel visiting Dad’s house and you guys must have done SOME KIND of clean up job before he showed up! Really miss Jack and the rest of the folks from Carlisle on IRT this season.